SALEM, N.Y. (July 15, 2014) - The National Elevator Industry, Inc. (NEII) is commemorating the 100th anniversary of the first recorded meeting of the Elevator Manufactures' Association (EMA), which later became NEII. In 1914, the first meeting took place in the Iroquois Hotel in Buffalo, N.Y. The trade organization was initially established in response to changing urban environments and the need for codes to safeguard the riding public in elevators. The organization developed the first model elevator code which would serve as the basis for today's modern ASME A17.1 safety codes. As the premier trade association for the building transportation industry, NEII's principle responsibilities remain the promotion and advocacy of the latest safety codes and standards, endorsing the adoption of the latest model codes by local government agencies and encouraging the introduction of safe, innovative building transportation technology. Development of the first model elevator safety code; "Uniform Regulations for the Construction and Installation of Passenger and Freight Elevators" in 1917. 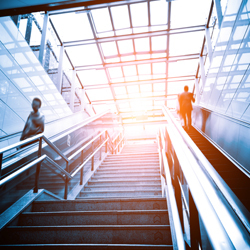 Release of "Elevator Layout Standards," which later became the "Building Transportation Standards and Guidelines, NEII-1," providing invaluable information on all products, standards, guidelines and terminology associated with vertical transportation. Development and distribution of "Safety Regulations for Field Employees" in conjunction with the International Union of Elevator Constructors (IUEC). Launch of CodeFinder in 2006, a single-resource for NEII member companies to find accurate, up-to-date information on all the local codes, standards and regulations that affect business and safety practices. A detailed history of the organization can be found on NEII's website. "NEII's story is one of unprecedented industry leadership, cooperation and achievement," said Richard T. Hussey, president of NEII. "As we celebrate our centennial, we also look to our next 100 years of helping make the elevator industry even safer, more sustainable and innovative for our customers, employees and the riding public."